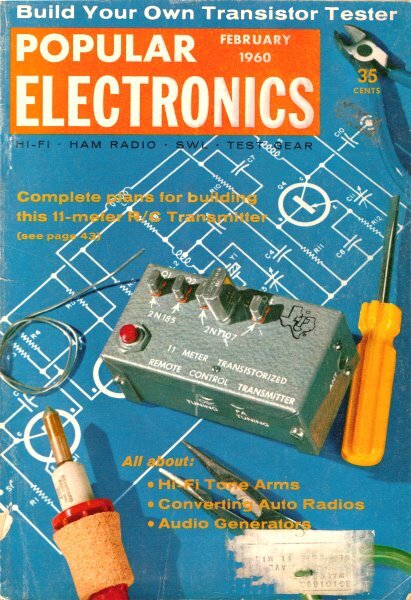 Integrated circuits are the de facto standard of today, but 40+ years ago when this article was written, individual transistors were all that was available to both hobbyists and professional engineers. Believe it or not, there are still a lot of applications in modern products that use discrete transistors for output stage drivers, buffers, and where parts costs might save a penny or two in high volume production. There are also, of course, millions of circuits in existence and in daily use that include transistors. This transistor tester will allow you to do a simple check to determine whether a particular device is still working, or whether some newer transistor might be a suitable replacement for one gone bad. The truth is, though, that unless you just really like to build circuits, you can buy a DMM with a built in transistor tester for $20- $30. 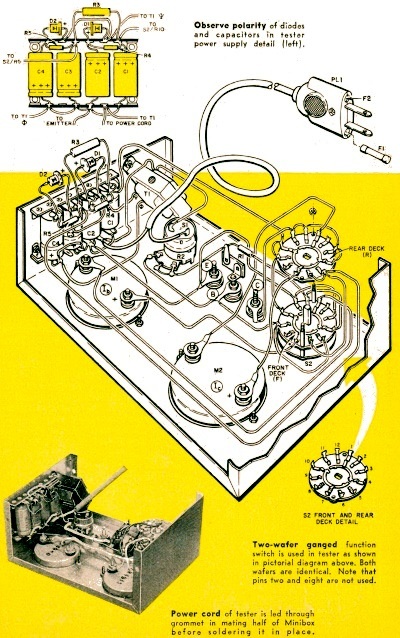 Sometimes you'll finish building a transistorized project and find that it doesn't work. It's easy enough to recheck your wiring, but if you do and the unit still doesn't work, then what? Were the transistors good before you put them in the circuit? Were they burned out accidentally? It's obvious that you need a transistor tester to check the transistors before you wire them into the circuit and to check them again if the circuit stops working. This tester measures the two important characteristics of almost all audio and power transistors: current gain (Beta) and collector-to-base leakage (Ico). Only transistors which have a 5-ma. maximum collector current cannot be tested with this unit; see the manufacturer's data for special testing techniques for these low current jobs. Two meters are built into the tester to allow the base current and the collector current to be monitored simultaneously under various bias settings. This monitoring feature enables a transistor to be tested under actual circuit load conditions. Transistor tester base current control R2 should be wired so that maximum resistance is obtained when ganged switch S1 is open. For maximum flexibility, no sockets were incorporated in the tester proper. The transistor under test is simply connected by its leads to the tester terminals. An adapter which plugs into the tester's binding posts can be built which will accommodate the various types of power and audio transistor sockets. Parts used in the tester and optional adapter are not critical. With all new components, cost of the tester is about $15. of the tester is begun by mounting all the components directly on the cabinet. Before mounting function switch S2, crimp all jumper leads to the switch terminals. After the switch is mounted, connect and solder the remaining leads to it. Observe polarity of diodes and capacitors in tester power supply detail (left). Two-wafer ganged function switch is used in tester as shown in pictorial diagram above. Both wafers are identical. Note that pins two and eight are not used. Power cord of tester is led through grommet in mating half of Minibox before soldering it in place. The transistor tester adapter can be built into the smallest Minibox that will accommodate a standard three-lead transistor socket (in-line or circular type) and a power transistor socket. When a transistor is being tested, the adapter's banana plugs (which are connected to the appropriate pins on the transistor sockets) plug into the tester's universal binding posts. Testing for leakage is simple. 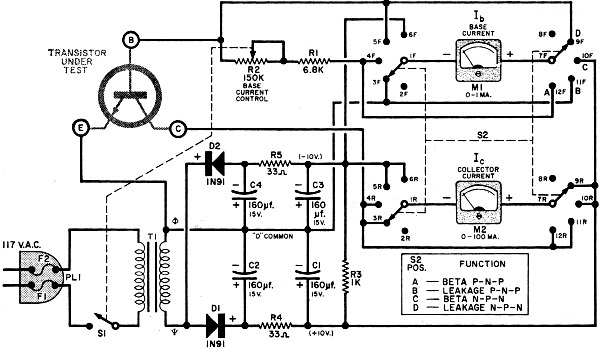 Rotate function switch S2 to Leakage N-P-N or Leakage P-N-P, depending on the transistor in question. Connect the transistor base lead to the tester's emitter binding post. Then connect the transistor collector to the collector binding post. Leave the transistor emitter lead unconnected. (The transistor emitter is left unconnected for all leakage measurements.) 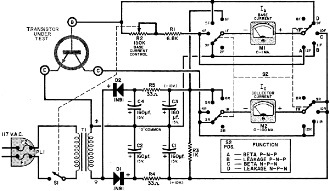 Now turn on the tester by advancing the Base Current potentiometer (R2). If the 0-100 ma. collector current meter (M2) is not deflected, the leakage current is within acceptable limits. You can safely measure the exact leakage current on the more sensitive 0-1 ma. 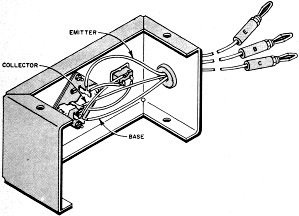 base current meter (M1). Turn off the tester and reconnect the transistor base and collector leads to the corresponding tester binding posts. Do not connect the emitter lead; keep the function switch in the "leakage" position. When you turn on the power, you'll find that most transistors will give little - if any - deflection of the 0-1 ma. 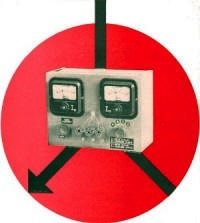 base current meter. Some low­leakage silicon units will give no perceptible deflection at all. Tester adapter has two sockets accommodating power transistors and smaller audio transistors. If the transistor passes the leakage test, you can safely perform the current gain (Beta) test. 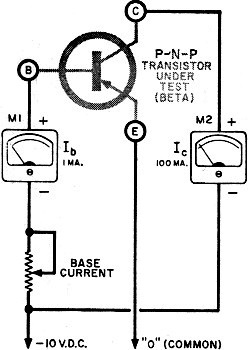 Current gain cannot be read directly on the tester, but Beta is very easily found by dividing the collector current reading by the base current reading. The Beta test is made by setting S1 to Beta N-P-N or Beta P-N-P. Make sure the power is off. Connect the transistor base, emitter, and collector leads to the corresponding binding posts. Check the manufacturer's specifications for the maximum collector current for the transistor under test and never exceed this value as read on the 0-100 ma. collector current meter. Now switch on the tester, but leave the Base Current pot full counterclockwise. Record the base current and collector current meter readings. Dividing the collector current by the base current will give you one value for the Beta (current gain) of the transistor under test. Current gain ( Beta) test for n-p-n transistors is identical to p-n-p test shown in simplified schematic but polarities of meters and power source are reversed by switching S2. Now increase the base bias current with the Base Current potentiometer. This will cause an increase in the collector current. Once more, record the meter readings and compute the current gain. Continue this process until you have several values for current gain. Note that Beta is constant except at the higher collector currents; this is a normal transistor characteristic. Check your computed values for the current gain against the manufacturer's specs to see if the transistor is up to snuff. You'll soon find that you'll have more confidence in the circuits you build and trouble-shoot. Using the tester, you'll be able to give transistors a rapid checkout and use them to best advantage. 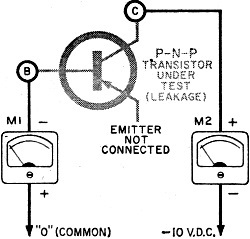 Leakage test effectively puts two meters in series with transistor as shown in simplified schematic. Polarities for n-p-n transistors are reversed as in Beta test.